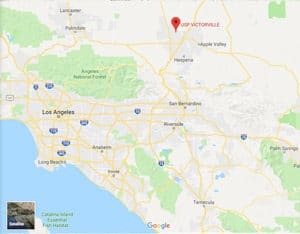 Part of FCC Victorville facilities including:USP Victorville, FCI Victorville Medium 1, and FCI Victorville Medium 2, with an adjacent minimum security satellite prison camp. Location: USP Victorville is located in San Bernardino County, approximately 85 miles northwest of Los Angeles, on Interstate 15. Medical Care Level: Level 3. See our page on Medical Care Levels and Procedures for more information. Background: USP Victorville opened in 2004. It is part of the Victorville Federal Correctional Complex (FCC). Notable inmates include President of Discovery Home Builders Ayman Shahid (sentenced to 46 months for mortgage fraud, wire fraud, and bank fraud), leader of the Cuban Five Gerardo Hernandez (sentenced to life in 2001 for conspiracy to commit murder and espionage, but his sentence was commuted in 2014 by then U.S. President Barack Obama), leader of the Chicago Latin Kings Augustin Zambrano (serving a 60-year sentence for racketeering conspiracy), and former MLB player Lenny Dykstra (released in July 2013 after serving 6.5 months for grand theft auto and providing false financial statements). Health Services: Emergency medical care, sick call, physical examinations, annual TB testing, medication, dental services, and eyeglasses are all provided at USP Victorville. While emergency medical care is available 24 hours a day, inmates must submit a sick call form in order to be evaluated for routine care needs. Psychology Services: Intake screening is provided for each inmate upon arrival at USP Victorville. Inmates can also speak with a psychologist briefly during open house hours or at main line. Psychologists also conduct various groups and workshops for inmates, such as anger management and stress management. Residential Drug Abuse Program (RDAP): USP Victorville does not house a Residential Drug Abuse Program (RDAP), but referrals can be made to institutions which do provide RDAP. A Drug Education class, the Non-Residential Drug Abuse Program (NR-DAP), Alcoholics Anonymous (AA), and Narcotics Anonymous (NA) are offered. Education Services: USP Victorville offers literacy, GED, and English-as-a-Second Language (ESL) courses. Inmates that do not possess a high school diploma or GED are required to participate in the literacy program for a minimum of 240 hours. Adult Continuing Education (ACE) and parenting classes are also available. High school diplomas and post-secondary programs are available through paid correspondence courses. Coastline Community College enables inmates to obtain an Associate’s Degree in either liberal arts or specialized business. Advanced Occupational Education: USP Victorville offers advanced occupational education in Automotive Service Excellence, Microsoft Office 2010, Recycling/Solid Waste Construction and Extraction Management, and ServSafe. Vocational Training: USP Victorville does not offer any vocational training programs. Apprenticeship: USP Victorville offers apprenticeships in HVAC and Plumbing. Library Services: Leisure and law libraries are available for the inmate population complex-wide. The law library contains the TRULINCS Electronic Law Library terminals, typewriters, and a copy machine. The leisure library offers newspapers, magazines, and fiction and nonfiction books to the inmate population. UNICOR: The USP Victorville UNICOR facility handles fleet management and vehicular components. Commissary: USP Victorville operates a commissary which provides inmates an opportunity to purchase items not issued or delivered as basic care by the institution as well as items of a different quality. The monthly spending limit is $360.00. Inmates may only shop once a week on their designated shopping day. Recreation Services: The USP Victorville Recreation Department offers a variety of hobbycraft programs, sports programs and leagues, leisure and holiday programs, music programs, and structured exercise/wellness programs. In order to provide the inmate population with increased recreational opportunities, inmates are afforded the opportunity to enroll in a housing unit art/hobby craft program. The resource library also offers literature, DVDs, and videos related to fitness/wellness. An Inmate Photo Program is also offered to inmates. The program provides inmates the opportunity to have photos taken of themselves and their visitors on scheduled visiting days.